We are all familiar with Tissot watches. The fine quality Swiss watchmaker has been amazing us with fantastic creations for over 100 years. Here is a peak at the T-Trend series by Tissot. The T-Trend women’s watches are really lovely. The Happy Chic T-Trend women’s watch is a favorite of mine. I love the big, bold square face on this watch. Tissot watches for women have such style and elegance, and this one in particular shows that off. This ladies timepiece is made from highly polished stainless-steel. The bezel and bracelet are both in this strong material. The Happy Chic features a crystal of sapphire, and a beautiful silver dial. The hours are marked with large Roman numerals, and the face is given a sunburst texture. Of course, this women’s watch is all Swiss made, so quality is a given, and so is style. Although I love the square faced Happy Chic, the version with a round dial is equally appealing. This Tissot watch features a two-toned stainless-steel and PVD bezel and bracelet, done in hues of grey and pink. The dial is a silver tone and has the same Happy Chic Roman numerals marking the hours. The Happy Chic is a wonderful series from Tissot watches! Tissot watches, Swiss-made excellence since 1853. Today, that reputation lives on, through their extraordinary watches. Fine craftsmanship and cutting-edge technology give Tissot watches their appeal. Let’s check out a few of their men’s watches. All of these are great and really affordable watches. First up, the PR50 Men’s Watch. This is a big, bold example of Tissot style. The T34148114 is a classic men’s timepiece. It has a large round dial, featured in white. The styling on the face is streamline, with big, easy-to-read numbers. The date window is located at the 3 o’clock mark and the Tissot name is proudly displayed under the 12 o’clock setting. The bezel is a scratch-resistant sapphire. The PR50 is an all stainless-steel men’s watch. It’s Tissot, so it’s all Swiss engineering means durability. If you like a bit more pizzazz, you might want to look at the Quatrato Men’s watch. This Tissot watch is part of the famous T-Trend collection. It has a stainless-steel case and bracelet, and features a deep blue dial. The dial is a square shape, with a masculine appearance. It is a handsome timepiece, great for the office or special nights out. These Tissot watches are in very traditional styles, but there is a Tissot for everyone. Racy and sporty, or sophisticated and business-like, more styles are out there. We’ll explore more next time. There are plenty of discounted watches on the web to choose from. Consumers can choose from fashion watches in the $200 range all the way up to high-end designer timepieces which could set you back $10,000, or more. For today, let’s highlight a few in the $250-$500 spread. First up is the T-Race Men’s Watch, by Tissot. Tissot is well-known (and respected) for their high quality watches. They are masters of timekeeping, so you know you’re getting a finely crafted watch. This men’s chronograph is made from polished stainless-steel, with a durable rubber strap. It’s rugged and hard-working looks give off a manly feel. Tissot has this watch set with a scratch-resistant sapphire crystal, and genuine Swiss movement. This awesome men’s watch is made for performance, but looks good too…and I found it at a 46% discount. Next let’s check out something for the ladies. We located the Classic Museum Woman’s Watch from Movado at a 51% discount. You can’t go wrong with this woman’s watch. It is quintessential Movado…sleek lines, streamlined, and beautiful. This particular version is featured white on white. The striking white leather bracelet is paired with a bright white face and it works. All of Movado’s artistry and craftsmanship is in this watch, and at this price it’s hard to pass up. Check out these and other discount watches on line, today. Happy shopping! Tissot Watches, founded in 1853, produced the first-ever production pocket watches. Their innovation did not stop there…the luxury watchmaker has since produced beautiful designs, rich in texture and style. Among these are timepieces crafted of materials like mother-of-pearl, wood, and even rock. Artistically, Tissot Watches excel, but pairing that with new and creative technology, really sets Tissot apart. Implementing the, first ever, T-Touch technology is a shining example of the dedication to craftsmanship that Tissot exemplifies. Tactile touch technology, or T-Touch allows the wearer to, simply, touch the face of the watch to alter the function. This invention marks a true milestone in watch making history. Tissot’s T-Touch watches are designed for everyone. There are sporty styles with colorful, rubber bands to classic gold, silver, and platinum creations. T-Touch series comes in both men’s and woman’s versions and with enough options to suit most any taste. 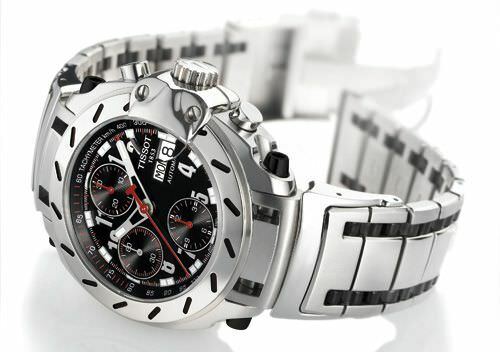 With all the accolades, you would think the prices would be out of reach, but Tissot offers watches for any pocketbook. Tissot produces nearly 2 million watches per year and offers tons of options. The T34.1.481.14 Tissot PR50 Men’s Watch is a beautiful example of their desire to offer the consumer a quality watch at a reasonable price. This watch retails for just $146.25. On the other end of the spectrum is the T71.3.445.11 Tissot T-Touch Men’s Watch. This watch is a masterpiece of design, offering T-Touch technology, with leather band and gold dial and accents. The T71.3.445.11 retails for $6,495.00. No matter your taste or budget, it’s clear that Tissot has a watch for you. You can’t go wrong with one of these fine watches, and with so many options offered, the only problem you will encounter is choosing the one you want.